Photo: C. Reid, Wishaw, N.H.3. Courtesy of The Harrison Weir Collection. 'Bogie' could truthfully be described as either the 'missing' or 'mystery' solid brown Siamese cat, or, in the measured opinion of the writer, as possibly the first and earliest Seal Burmese or Tonkinese cat to arrive in the United Kingdom. That opinion is based upon her amazing phenotypical traits, which include a glossy dark-brown, close-lying coat, with head and body type that would rival foundation Burmese cats bred in the USA and the UK, half a century later. Her type in fact, rivals even cats bred much later than that, possibly giving us a true glimpse into what the original Seal Sepia Burmese cats may have really looked like. That we know anything about her at all, is nothing short of miraculous. It is never wise to deal in absolutes, because history sooner or later usually proves them to be wrong. A prime example of this, was when a medium brown coloured 'Wong Mau' was assumed to be a fully pure Burmese) when naval officer Dr Joseph C. Thompson, of San Francisco, imported her into the 'West' from Burma in 1930. 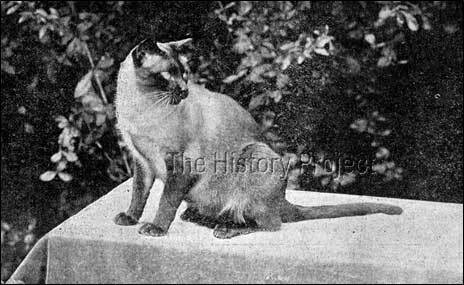 But she was later proved (by the resultant litter she produced to a full Siamese) to be a hybrid, (genetically a mink) and therefore, probably the earliest true Tonkinese cat of record. And it was only due to the hard work of American breeder/geneticists, that the true pure Sepia (which would breed true for that density of pattern and regarded as a genetically genuine Burmese) cat, was produced from her lines. Even so, was she the first of her kind to come to the 'West'? There are many records of so-called Black and Blue Siamese cats in the original registers, some have 'Royal Siamese' parentage, at least recorded as that in the official register. Very few, are described as 'pointed' although one or two certainly are! The one thing of which we can be certain…is that we cannot be certain! And 'Bogie', who looks so unique for the era, will serve to challenge our beliefs yet again. This little dark-brown cat was not registered. Nor do we have any indication, even in the two articles extant which speak of her, any indication of her age or date of birth and there are no known records of her parentage or how she was obtained. She was of course, called a Siamese, but as we have pointed out on other occasions, any cat, regardless of colour or pattern that came out of 'Siam' (Thailand), was described as a Siamese. If indeed she was a Burmese, it is possible that she lived to a considerable age, as many Burmese cats are prone to do! 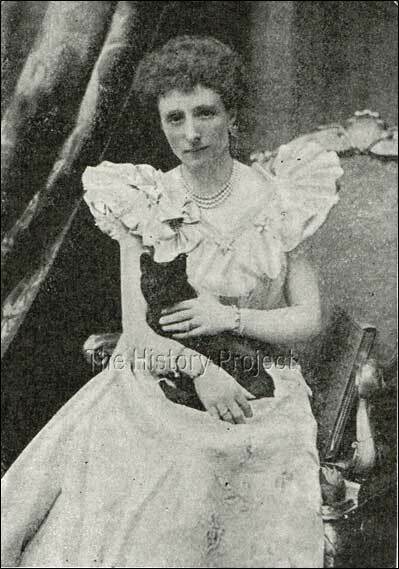 The only thing we can be sure of, is that she was owned by Mary Russell, the then Duchess of Bedford, who just also happened to be the President of the National Cat Club. (Herbrand Arthur Russell and Mary Russell). How do we know this? 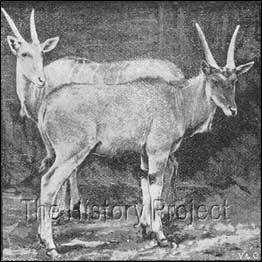 The Duke and Duchess of Bedford (Herbrand and Mary Russell), both had a considerable public profile in the cause of Animal Welfare, both being passionately devoted to natural history, the outdoors and sport. 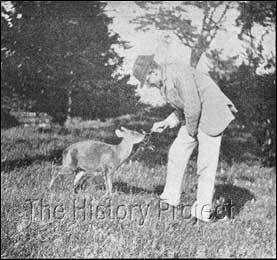 It was at their original estate of Cairnsmore, Palnure, Galloway, that they began their collection of rare animals. 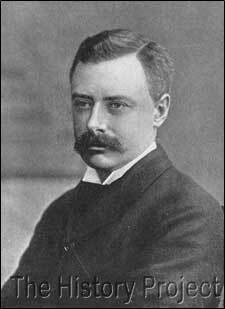 But neither had expected to be catapulted into the responsibilities that went hand in hand with a ducal coronet, when Lord Herbrand's elder brother, the tenth Duke of Bedford, died suddenly after having held the title for only two years. The vast and elaborate estate at Woburn was over time transformed into a virtual private zoological garden, and the Duke and Duchess became inextricably linked to a good number of charitable organisations, whose chief work was to protect various classes of animals from cruelty and neglect. Just a few examples of the animals in Woburn Park. Below left: His Grace with a Barking Deer; Below right: Her Grace feeding Halpha, her Arab Horse. The Duchess was known to be an expert horsewoman, and an exceptional shot, often to be seen walking for miles about the Woburn estate with her gun and dogs. She devoted considerable time to the care of the sick, promoting and assisting in the establishment of hospitals, even engaging in ambulance work, and by virtue of this, became a lady of Grace of St. John. 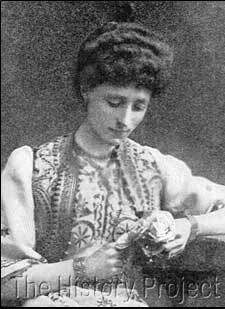 One of her hobbies was amateur photography and a number of her studies appear in this article. But it is in her love of the cat that we have come to know her best, both as joint Patron with His Grace, of the Society for the Protection of Cats, and in her role as President of The National Cat Club. 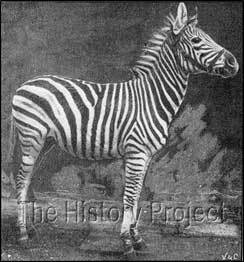 Amongst the Woburn menagerie, which included wild animals such as those shown in the above photographs; could be found the domestic varieties, being horses, dogs, and a small but select collection of cats. These included over time, the Royal Siamese cats named 'Satu', 'Bigit','Chowfa', 'Saiwan',and 'Goblin', not forgetting the little solid dark brown cat, 'Bogie'. Longhaired cats included 'Tommy' (aka Thomas Puss), a half-breed Brown Tabby of Persian type; 'Billy' (aka 'Bill Beresford', so named for the famous person from whom he had been received as a gift); 'Fritz', a Silver Tabby Persian, rescued as a kitten from the streets of London; and a black and white domestic cat named 'Napoleon', who, after his adoption showed that he preferred the outdoors, and could generally be found on the terraces near the stables, which he invariably jealously guarded from any feline would-be intruders! That 'Bogie' should be called a Siamese, simply denotes that she was either a direct import from Siam, or from cats that were direct imports. 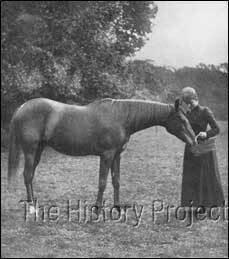 It seems likely that she may have been a direct import herself, but regardless of whether she was or not, she was clearly not a Siamese of the 'Royal' or pointed variety, and her descriptions belie the fact that she was considerably dark in colour. If we remember that many of the semi-pointed cats from this era, (those most resembling a mink tonkinese in intensity of colouration ), were described as 'Chocolates' and even officially recognized by the Siamese Cat Club as a variety within the breed; then it is unique that she is generally described as a dark-brown cat. 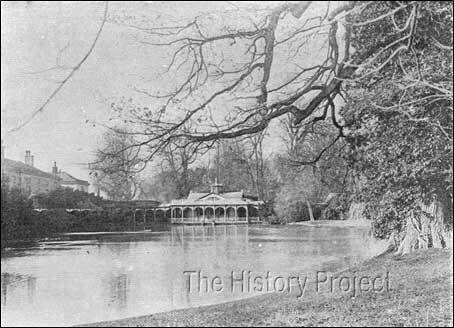 The Chinese Dairy Pond at Woburn Abbey,from the lead page article written by Louis Wain, published in 1895. Our first introduction to this cat is in an article written by Louis Wain, when as Chairman of the Committee of the National Cat Club, he had paid a visit to Woburn Abbey to write about the many beloved pets of the Duke and Duchess. Published in 1895, the writing of this article can be dated fairly accurately to a period near the end of 1894 or as late as January 1895. In it, Wain describes a Longhaired half Persian cat which was a favourite of the Duke, named 'Tommy' (also affectionately known as 'Tom Catapuss' or 'Thomas Puss'), who is known to have died in February of 1895. 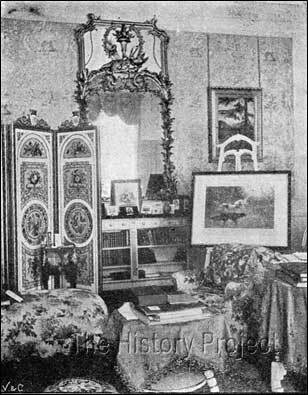 The Cats sitting-room at Woburn Abbey. It is indeed noteworthy that he describes her firstly as a 'whole-colour' cat, and as 'very dark-brown'. Mr. Wain was an experienced observer of cats, and therefore not un-used to assessing colour. But we must also remember that at this time, there was absolutely no understanding of the concept of 'degrees' of pointing, so it should come as no surprise to us, that the lighter-to mid-brown cats that were in fact semi-pointed, were most often described as Chocolates, when they were in all likelihood, seal mink. Describing 'Bogie' as dark-brown, and as 'whole-coloured' suggests that he considered her to be a self-coloured cat, or what we would call a self-seal, much closer to the description in alignment with the term seal sepia. It is unlikely that the fact that this cat may still have been modestly darkest on the tips of the ears, face, bottom of the feet and tip of tail, was even noticed. 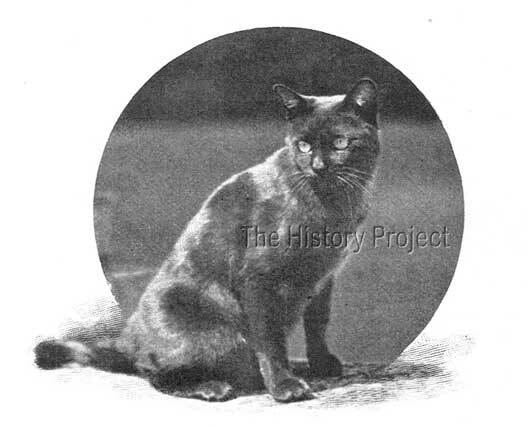 Given that we know today, that 'Wong Mau' was in fact a hybrid, and that despite this, she was more compact in the body, with a shorter tail, and with a rounder short-muzzled head than a Siamese, then we are lead to wonder what a non-hybridised cat, that was already a pure-bred Burmese must have looked like! Surely, more like the cat we see in the amazing photograph by Charles Reid, of 'Bogie' on the lawn at Woburn Abbey, taken in 1901! in her private apartments nursing 'Bogie'. 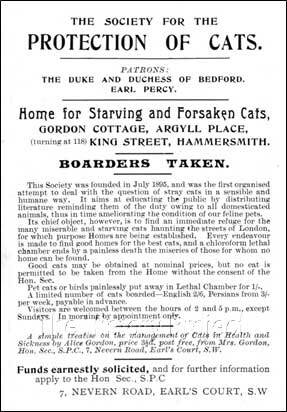 Two full page advertisements that appear in 'The Cat Manual' published in 1902, one for The Society for the Protection of Cats (SPC) and one for The National Cat Club (NCC). 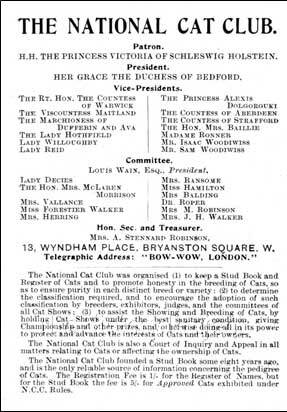 The Duke and Duchess of Bedford are both listed as Patrons of the Society for the Protection of Cats, while the Duchess alone is listed as the President of The National Cat Club. The existence of 'Bogie' currently challenges what has formerly been claimed, - that 'Wong Mau' was the first solid Sable or Seal Brown cat to arrive into West, including Europe*. She is clearly a candidate for not only being the first Seal Brown cat of record in Europe, but could possibly lay claim to being the first full 'Burmese' cat, known to have lived in the United Kingdom. She also may demonstrate that the original Burmese cat was a short-bodied compact cat of moderate size, with a shorter tail, and a shorter, blunter, more rounded wedge than the Siamese, and with rounder eyes. Her dark colour is confirmed in both photographs, dating from 1901 and it is clear from the excellent photograph taken by C. Reid, that her glossy coat and phenotype is unique, even when compared to the rare images we can find of 'Wong Mau' taken in the 1930's. It is up to the reader to decide for themselves just where she fits into the incredible array of natural breeds to have come out of South East Asia. Of one thing we can be sure, the cats of the Orient have left an indelible mark on the Cat Fancy and these images of 'Bogie' can only serve to remind us that we have much more yet to learn.